Embroidery and biscornu patterns for a rainy day. 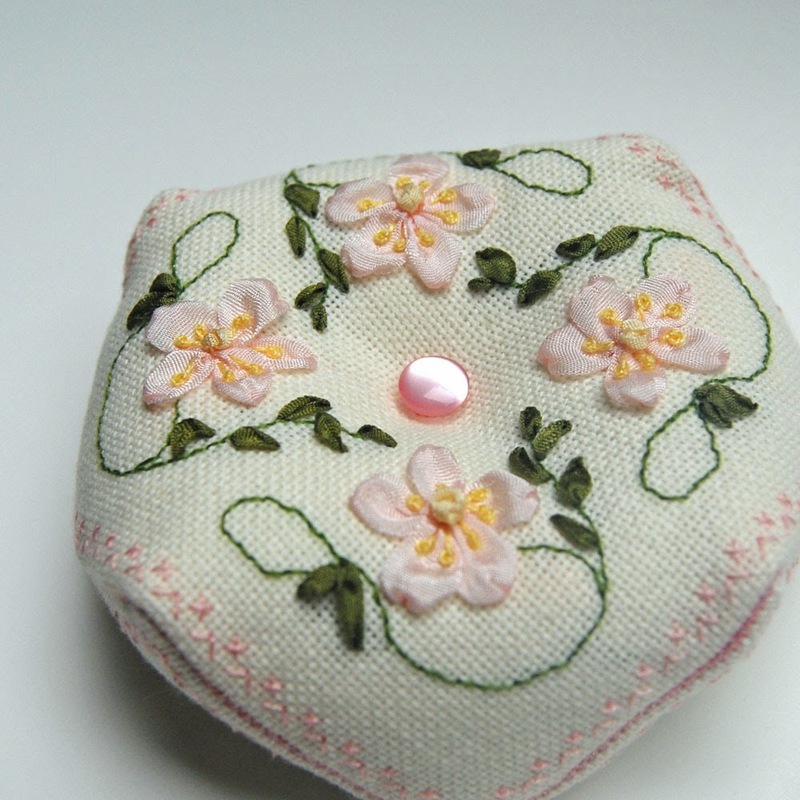 This is a sweet and simple biscornu for beginners to try their hand at ribbon embroidery. I created this one in 2010, after getting hooked on the amazing designs of Di Van Niekirk and Deanna Hall West. I found a great reference at Half Price Books, An Encyclopedia of Ribbon Embroidery Flowers - by Deanna Hall West - and set about creating this biscornu. As you can see, I kept the border very delicate, and I love how it turned out! The overall pattern above is intended for evenweave linen, with each square representing two threads. Prepare Fabric – Strongly Recommended! • Mark center lines: Using a single thread of any color, work a basting stitch over four threads through the vertical and horizontal center lines. If desired, mark additional guidelines at intervals of 10 stitches (20 threads). • Whipstitch the outer edges of the fabric to prevent unraveling. • When using even-weave linen, each square of Chart 1 represents two horizontal and two vertical threads. 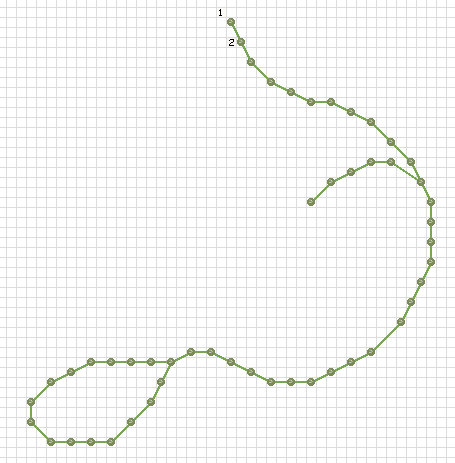 Some patterns refer to this as working “over two.” In Chart 2, each line represents one thread. • Use one thread of DMC 580 Dark Moss Green. • Each line of Chart 2 represents one thread. • Use a Double Running Stitch: Come up at dot 1, and go down at dot 2. Continue to follow the dots, working every other stitch in one direction, and then fill in the other stitches on the return journey. 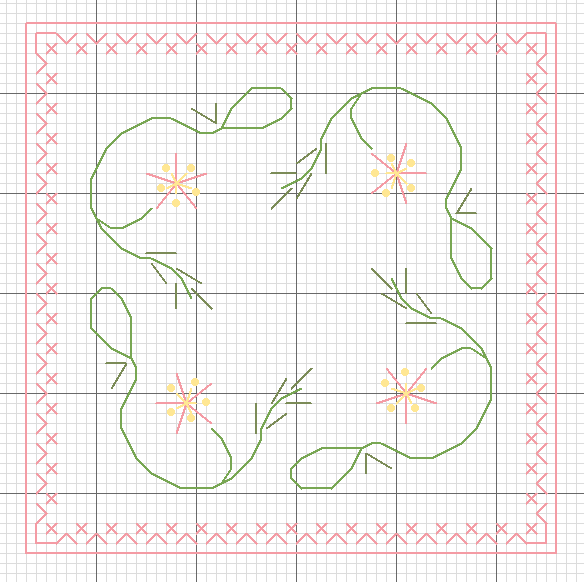 • Using one thread of DMC 776 Medium Pink, work outer border as shown in Chart 1. • The placement of leaves is indicated by the dark green lines along the stem in Chart 1. • Using YLI 171 – 4mm Dark Yellow Green, work ribbon stitches for leaves. • Bring needle through fabric close to the stem. • Lay the ribbon flat against the fabric, along the line indicated. Pierce the ribbon with your needle, and slowly draw the ribbon through, allowing the leaf to curl. Don’t pull too tightly, or a straight stitch will result. Leaving the leaves loose gives a more natural effect. • Flower petals are indicated by the straight pink lines seen on Chart 1. • Come up at the base of each line. • Come down at the outer point, and gently pull through the fabric. A toothpick can be used as an aid – placing the toothpick between the ribbon and the fabric as you pull through allows you to keep it from twisting, or pulling through too hard. • Using YLI 12 Light Yellow 4mm, Come up at the center of the flower. • Work a loose French knot. Finish as a biscornu, or add to a quilt, or needle book...anywhere a feminine touch would make you happy. Enjoy - I hope you like ribbon embroidery as much as I do - it's so exquisite when finished.I also enjoy the fact that little mistakes don't matter so much, because in the end a loose natural look is achieved either way. There are wonderful books out there with lots of inspiration - so, if you want more information, designs or guidance - check out Amazon's stock. There are some beautiful projects waiting for you! Caroline, thank you so much for this amazing design! 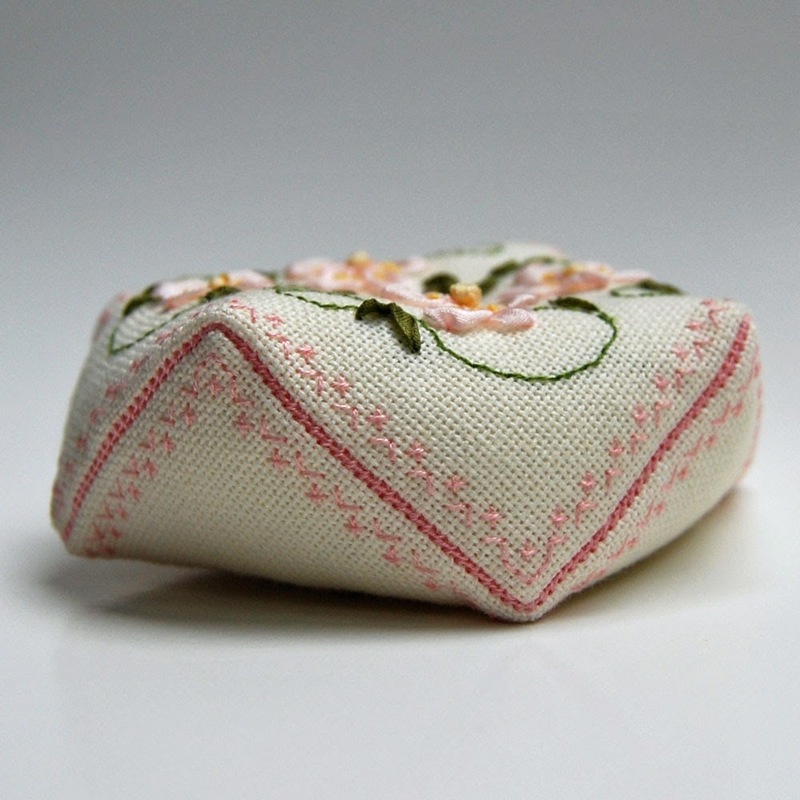 I have never learned ribbon embroidery, but now I see this beautiful biscornu I am going to try it. I design embroidery patterns, mostly because I love making them. Sometimes when it rains, I get to pull out my embroidery and curl up by the window. A perfect way to spend an afternoon. All Rainburst Embroidery designs are copyrighted.. Simple theme. Theme images by Ollustrator. Powered by Blogger.